Between Halloween, competing events, quarterly reporting, quiet periods, road shows, a general malaise in the mortgage industry and a public exhausted by election season, participation in this year’s event will be much more intimate than in previous years, all of which makes the efforts of every one of you to be here that much more special. At the same time, it provides an opportunity to get to know those who are here that much better. While our numbers are down, the caliber of this year’s content and speakers is exceptional. I hope that you will learn some things that you didn’t already know, get inspired by new ideas, and perhaps change the way that you think about the industry in a way that contributes to your greater success. This is the 14th year of the original EUROCATALYST and today’s AMERICATALYST event. Our theme this year is, FAST FORWARD: What Happens Next. One of the most difficult things about creating the program for this event each year is the ubiquitous nature of the housing ecosystem. It is literally affected by everything, and everything is affected by it. By looking at it in the context of globalization, which constantly changes everything faster than anyone can keep up with, each year I begin writing the program from a blank slate. Where we are today is much different than where we were yesterday, or last year. Excluding GSE reform, but hopefully you get my point. For me personally, it is particularly sad to feature the session “Pandora’s Box: Brexit, the Future of Europe and the World Economy.” Of my 30 years in this industry, 14 of them were spent living and working across all EU and non-EU countries. It was there that I was able to implement my greatest career ideas and achievements, and it was truly the experience of a lifetime. The session is also quite poignant and hearkens to the prescience of the very first EUROCATALYST event in Madrid in 2002. My theme that year – much to the dismay of the European Commission and European Mortgage Federation – was, “Will European Markets Survive Globalization?” As this year’s session will discuss, we now know the answer to that question. The unraveling is just a matter of time, and will have a phenomenal impact on the U.S. and the rest of the world. As most of you know, the factor that differentiates this event from all others is the context in which we look at the most important issues facing our industry, and where it is headed next. Up to this year, that context has been globalization. While there are very intense academic, political and social debates about what globalization is, when it began, and the ideology behind it, for the purposes of this event I am not referring to globalization as one dimensional change but a set of changes, or forces, driven primarily by technology and electronic communication. These forces are social, cultural and political – and not just economic. They widen, deepen and intensify the acceleration of global interconnectedness in all aspects of our lives, and have driven us into a universally shared economic and political arena. It is a convergence (hence our theme in 2011: Convergence) and state of interconnectedness that I refer to as “The Entanglement,” which was the theme of this event in 2012. While today’s interdependent world demands cooperation, compromise and collaboration in order to survive the future, the rise of political extremists and movements around the world show anything but. The forces of globalization have altered the structure of states, the nature of economies, our basic institutions, our ideals, the way that we live, and the way that we finance how we live. It encompasses such fundamental and radical changes to our existence that it shifts our knowledge of the world to what we don’t know, rather than what we do know. In short, globalization renders the words “unprecedented” and “unintended consequences” redundant. This year, I see something new replacing globalization, which Kevin Kelly, the founder of Wired Magazine, refers to as “The Technium.” The Technium is the convergence of technology, culture and economics. At the center of every significant change in our lives now is some kind of new technology. As the accelerant of humanity, technology dictates that we all will live in a permanent state of beta testing from here on out. On the other hand, looking back at history we see that every idea and every ideology put into action is one grand social experiment in which we don’t really know the outcome. Think about that as you listen to the dialogue of this year’s event. The future is never pre-determined unless apathy triumphs action. There is no algorithm for the future. Located on the Hill Country Veranda (weather permitted). Backup location is the Wildflower Atrium. Since 2008, policy response to the “financial crisis” has resulted in a paradox: unprecedented monetary intervention has created a massive overhang of liquidity, which has recently been linked with severe market illiquidity. With interest rates at or below zero in most advanced economies, the monetary base in the U.S. has quadrupled. These actions have reduced the volatility of bond markets, and have caused asset prices (including equities, real estate, and fixed-income private- and public-sector bonds) to soar. Yet sudden shocks and extreme volatility are occurring more frequently throughout the global financial system, fueling fears that even very deep and liquid markets such as US stocks and government bonds are not liquid enough. Today, the Federal Reserve’s creation of macro liquidity has resulted in more crowded trades and greater investment in illiquid fixed-income bond funds – most of which allow investors to exit overnight. At the same time, tighter regulation has led to high capital costs which, in turn, has reduced profit incentives and virtually eliminated market makers for fixed-income products. As a result, when market shocks occur, the re-pricing of fixed-income products is abrupt and dramatic, and investors caught in crowded trades need to exit swiftly. Because many investments are in illiquid funds without traditional market makers, sellers are forced into fire sales. The paradox of macro liquidity and market illiquidity has the similar effect of a flood during an extended period of drought. Macro liquidity is the equivalent of a flash flood, fueling booms and bubbles in its wake. Market illiquidity is the drought. What happens when drought-stricken areas experience excessive amounts of rain? Landslides. When the ground literally accelerates downhill, the effect is more damaging than the trigger. Any questions? This session looks at the pervasive lack of liquidity throughout the housing finance ecosystem from whole loans, to mortgage-backed and government securities and MSRs; the implications of the liquidity crisis for the near future, and what can or should be done to prevent disaster. For the past 14 years, this conference has been discussing the evolution of the housing market in a hyper-globalized world. In our context, globalization is not a single economic phenomenon, but a set of changes that are social, cultural, political, economic, and technological, all of which impact the entire housing ecosystem and not just the finance of it. Those forces, in turn, have created a world with greater complexities and unpredictability, and a world beyond our control. “The Technium” is a term coined by Kevin Kelly, one of the foremost members of the influential tribe of Silicon Valley trailblazers and technology futurists known as “the digerati”. Similar to our view of globalization, Kelly defines “the Technium” as “the convergence of economics, culture and technology” and focuses on technology as both the driver of new problems as well as new solutions. Where globalization is a “winner take all” world, the Technium is an organism of our own making that increases the number of races in which you can win, and new ways in which to win those races. In Part One of this two-part session, Toni Moss discusses how big data, machine learning, and increased computing power will soon make artificial intelligence (AI) ubiquitous, and the profound consequences of it. In discussing the latest advances in technology in the world today, Toni aggregates the commentary and ideas of the leading technology futurists to explain how those technologies are being used; what business models are using them (and in fact what those businesses actually are); how they are dramatically altering the entire housing ecosystem, and the new challenges and opportunities presented by them. This session continues our 14-year narrative about the impact of globalization on the housing ecosystem by picking up from where we left off with last year’s theme, “RUBICON: No Turning Back.” RUBICON stressed the unprecedented nature of the world today, and emphasized the need to focus on the future as opposed to expectations of or comparisons to a return to the past. This collaborative and interactive opening session establishes the foundation for this year’s event by bringing together six of the best minds in housing to create a comprehensive S.C.O.R.E. (Strengths, Challenges, Options, Responses, and Effectiveness) analysis and strategy assessment of the entire U.S. housing finance system. Our focus is not only on what should change, but how it can transform into a more vibrant, equitable and sustainable system moving forward into the future. Today’s astounding technological advances include big data, artificial intelligence, robotics, 3D printing, digital currency, and blockchain, among many others. These advances occur so rapidly that our ability to invent new Things outpaces our human ability to control them. Despite the tools that currently exist, for the most part, the technological advances in the mortgage and real estate industry are more “improvement” than true innovation. Part of this is due to the fact that regulators’ ability to control our new Things outpaces our ability to invent them. (Yes, you read that right). The other part is due to the legacy systems on which we have built an endless series of layers rather than make the necessary investment to rebuild outdated systems. As such, new market entrants enjoy significant advantages over established institutions. One thing is clear: The greatest change in the world is not just the pace of change, but the prevalence of it. From here on out, we live in a “beta” state of constant adaptation, which requires the equally persistent need to create and learn upgraded versions of everything. Unrelenting change means that our processes to accommodate change have not only become more important than our products, our process is our product. In the conclusion of this two-part session, we feature leading industry players and technology providers to discuss how new technology will dramatically alter the housing finance and real estate industry and which sectors should, or are, vulnerable to change. We will also discuss how we can leverage new technology to improve existing products, processes and practices, as well as feature firms with new business models who are leading the real estate and housing finance industry into the future. Affordable housing is not just a low-income problem anymore. The “American dream of homeownership” is being replaced by the American dream to find an affordable home to live in, whether owned or rented. Not only is there a lack of affordable homes to purchase, there is also an extreme lack of affordable homes to rent. Homebuilders are no longer building any material new supply of entry-level “workforce” housing, creating a significant supply/demand imbalance for affordable single-family homes with first-time buyers. In their 2015 study, “Projecting Trends in Severely Cost-Burdened Renters”, an analysis by Enterprise Community Partners and the Harvard Joint Center for Housing Studies found that the number of households spending 50 percent or more of their income on rent is expected to rise at least 11 percent from 11.8 million to 13.1 million by 2025. At the same time that rents are rising, homeownership rates are declining, incomes are stagnating, and job layoffs are increasing, all of which portray a bleak picture of the increasing severity of renter burdens for the coming decade. Why should you care about affordable housing? Despite the variation in types of housing, the housing market itself is an ecosystem. Like any ecosystem, every part of it is interdependent and a dramatic imbalance in one part eventually, if not immediately, affects the entire system. In addition to dystopian social outcomes, housing becomes more expensive when demand outstrips supply. Add to that a Federal Reserve policy that drives a housing bubble, and we have another serious crisis at a time when the Fed has run out of tools to manage it. This session delves into how the current crisis negatively impacts the entire housing ecosystem and what’s at stake, and introduces some innovative market-rate development programs designed to mitigate the crisis and rebalance the system. Invitation only and locations vary. Today, equity sharing is making a comeback with a variety of differentiated strategies to establish institutionalized platforms, processes and products. Buoyed by the Federal Reserve’s September 16th report stating that American homeowners have $12.7 trillion in equity in their homes (amounting to double the equity as of 2011); a more creative solution to overcome restrictive lending standards; strong support from private equity firms investing in new startups, and investors seeking greater yields (or any yields for that matter), Equity Sharing 2.0 has arrived. This session features two of the leading players in this rapidly growing sector: the very visible Point Digital Finance, backed by Silicon Valley titans including Andreesen Horowitz; Greylock Partners; Ribbit Capital; as well as Brad Greiwe, the co-founder of Invitation Homes; Laurence Tosi, the CFO of Airbnb and Vikram Pandit, formerly of Citigroup, among others; and the seasoned stealth player RevEx, the brainchild of Weiss Analytics founder Allan Weiss. Both models have enormous positive implications for institutional investors, lenders, homeowners, potential homeowners, and Single-Family Rental investors. This year’s debate is focused on the viability of the product and sector, delves into the details of all players in the sector and how each firm is differentiated, and enables participants to provide robust feedback on how they might tailor the model and its prospects and implications for the future. The U.S. homeownership rate has dropped from a high of 69% in 2004 to its current rate of 63%--the lowest rate since 1965. While banks have almost doubled their core capital since 2007/2008, the mortgage system outside of the banks is largely nationalized, insufficiently capitalized and barely profitable. Worth slightly more than the stock market, the $26 trillion U.S. housing stock is perhaps the largest asset class in the world. In combination with the $11 trillion of debt in the U.S. housing finance system, this makes the American housing market one of the largest concentrations of financial risk anywhere. It remains inextricably linked to the global financial system, with $1 trillion of mortgage debt owned abroad. Despite this increasing global systemic risk, in the ten years since the most severe recession since the Great Depression, the U.S. housing finance market continues unreformed, fundamentally flawed, and ultimately unsustainable in its current condition. While there is much more at stake than just the housing finance, in this segment we focus on the unintended consequences of Federal Reserve policy on the housing market and the chain reaction impacting not only housing, but every other asset class for at least the next two generations. The session features Danielle DiMartino Booth, who is the author of the soon-to-be-released book Fed Up: An Insider’s Take on the Willful Ignorance and Elitism At the Federal Reserve. In his 2013 book The Great Deformation: The Corruption of Capitalism in America, David Stockman, former Congressman, director of the Office of Management and Budget and the “Father of Reaganomics”, persuasively argued how the American state – and Federal Reserve in particular – has fallen prey to the politics of crony capitalism and the ideologies of fiscal stimulus, monetary central planning, and financial bailouts. The result has been unrelenting political dysfunction, fiscal collapse, and “casino capitalism”, which swindles the masses and enriches the few. In his new book, Trumped! A Nation on the Brink of Ruin … And How to Bring It Back, Stockman discusses how the rigged American system has led to the rise of Donald Trump (as well as Bernie Sanders). Despite the book’s title, Stockman is not an advocate of Trump’s candidacy or message, but instead focuses on the extent to which Trump is the messenger and rallying force behind the political insurrection of Main Street. This segment is focused on Stockman’s ideas on a way forward to economic recovery and prosperity at home and a more safe and stable world abroad. The transition of traditional real estate transactions onto the Web is nothing new, but enhancing the online real estate process with artificial intelligence and virtual reality will change everything. Currently, most online firms are focused on saving their customers time. Meanwhile, market leaders are already developing more fluid technological structures that will enable customers to experience properties through virtual reality and transact in real time, accelerating purchase and sales decisions to a matter of minutes. In his presentation, Ten-X CEO Tim Morse provides a clear view of the future of real estate and how advances in the online search, selection, acquisition and disposition of real estate will aggregate a global base of buyers and sellers, and drive the entire housing ecosystem into the stream of now. Over the past seven years, central bankers have gone to unprecedented lengths to find new ways to create monetary stimulus within current central banking frameworks. During this time, official interest rates in the US, UK, and the Euro Area have been reduced to zero. Taking it a step further, each of these countries has augmented monetary policy with massive Quantitative Easing programs: The purchase of massive volumes of long-term government securities to reduce their yields. Even further, these institutions have initiated credit easing and liquidity injections in the banking system by purchasing private assets in order to reduce the costs of private-sector borrowing. Further still, they have introduced forward guidance on monetary policy to keep these low interest rates down for a protracted—and undetermined—period of time. Other countries have gone to even greater extremes such that today almost a quarter of the global bond market now has negative interest rates. While these endeavors may have prevented inflation (thus far), fund managers argue that these central bank efforts have distorted the price discovery functionality of global markets to such extremes that they have “broken the market” entirely. Bankers and businesses have gone on an investment strike and use cheap central bank money to inflate the prices of their own assets. The result is a massive bubble in house prices, real estate, and equities, as well as the devastation of bond yields, and the rising number of investors and retirees who are forced into ultra-long government debt which severely restricts their liquidity. If below-trend growth continues and tail risks—economic, financial, political, or geographical—occur, central banks are out of options. Having reached the limits of existing frameworks, they must now contemplate whether or not to redesign the engine mid-flight to keep the plane from stalling. As noted earlier in this program, US homeownership has dropped to the lowest percentage in over 50 years, from 69% to 63%. The six million homes affected by the mortgage crisis comprise the majority of the new rental housing stock. Contrary to initial industry-wide doubts, the Single-Family Rental sector has continued to grow from strength to strength since its inception in 2010. While there are reasonable concerns surrounding the sector—such as the ability to acquire homes in scale and the difficulties of profitably renovating, re-leasing, and managing properties en masse—its maturation has been bolstered by factors such as tight lending for aspiring homeowners, rising home prices making home ownership out of reach for middle class families, and a generational shift favoring the access to single-family homes over their ownership. Today, revenue and margins for owner/operators are on the rise. The market demand for rentals continues to soar with a 97% occupancy rate for stabilized portfolios; rental rate growth for both renewals and new rentals; markedly lower turnover than the multi-family sector; continued house price appreciation in key SFR markets, and demonstrable improvement in operating metrics differentiate the sector as a strong, growth-oriented investment alternative. Despite these remarkable factors, access to growth capital remains a key challenge. While upward trending stock prices indicate the success of publicly traded REITs, the stock market has yet to award full credence to the underlying value of the real estate or sustainability in SFR cash flows, as shown in the discount in trading levels of all its publicly traded stocks. While this highlights a long-standing concern, recent developments are an encouraging sign for the future. The successful overnight execution of a nearly $1 billion secondary offering of AMH (American Homes 4 Rent) stock by the Alaska Permanent Fund Corporation last month was remarkable for its sheer size and speed of execution, and an important indication of the sector's growing acceptance by institutional investors. With private equity—both institutional and retail—continuing to rapidly enter the space, SFR may well be breaking through in its liquidity and varying price points. 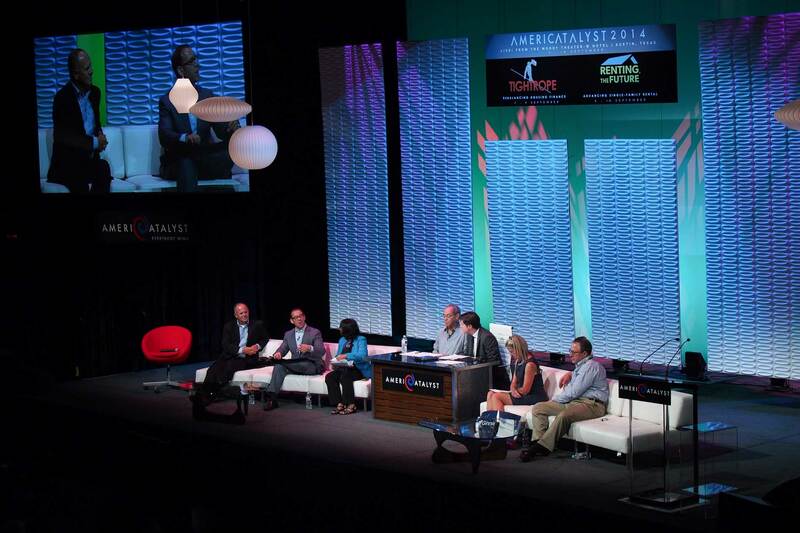 This session picks up from the keynote Single-Family Rental session at RUBICON AmeriCatalyst 2015, “Renting, The Future,” which featured leading institutional SFR operators discussing the changing strategies, obstacles, and opportunities they face in capturing the fastest growing sector in the housing ecosystem. This year, we bring together leading players to collaborate on a comprehensive S.C.O.R.E. (Strengths, Challenges, Options, Responses, and Effectiveness) analysis and strategy assessment of the U.S. SFR market. The continuing evolution of Single-Family Rental has given birth to a number of entrepreneurial activities and new avenues to serve or grow the sector. Traditional fix- and-flip models are much more sophisticated and capitalized with institutional equity driven by algorithmic technology and processes; the build-to-rent approach has proven quite profitable and strategically accretive in key markets; the lease-to-own platforms are appealing to families who currently cannot qualify for a mortgage but have the credit and income trajectory to do so; the development of platforms and marketplaces offering comprehensive, turnkey due diligence, property management and asset management for retail and institutional investors anywhere in the world to buy and sell individual or portfolios of properties are in their infancy; and Property Management 2.0 - a consolidation of property management companies offering streamlined, professional services to significant retail and institutional investors is now here. In Single-Family Rental, every aspect of the sector is on the rise. This session features some of the new trends and ideas to significantly enhance or improve the Single-Family Rental sector. Leveraging technology, big data, inefficiencies, demographic trends and even improving on pre-existing processes, these firms are on the rise and capitalizing on the dynamics in the market as well as the investors' desire for positions in hard assets, high-growth opportunities and exceptional returns. As discussed in our previous session “One Trick Pony,” the “blowback” from the Federal Reserve’s protracted period of interest rate suppression has resulted in massive bubbles in real estate and house prices and in turn, has priced many Americans out of the housing market entirely. We’ve been here before. In 2006 American house prices rose unabated for the previous ten years, reaching an all-time high that year. While homes have recovered nearly all losses from the 2006 crash, when adjusted for inflation they are currently 20% below the 2006 peak. Some see this as an indication of further room for house price appreciation. On the other hand, as house and rent prices rise, incomes remain flat and credit remains tight. Something has to give. One of the more encouraging differences between the crisis and today is greater access to historical data, the ability to utilize that data to better anticipate the direction of house and rent prices, the most granular accuracy on current (and some would say projected) pricing, and the creation of “early warning systems” to enable lenders and regulators to better prepare for a steep decline. However, key economic data used for making critical national economic decisions is flawed in that current measures of inflation do not adequately factor in house price inflation. This is not just a national problem. It is a global one. This past July, editors at The Economist recently described rising U.S. house prices as “a dangerous menace to the world economy”. This information-heavy session provides facts and figures with diverse conclusions on house and rent price projections and their impact. Along the way, we will show the cities with the greatest risk/reward profiles for residential investment and rent price appreciation. Inevitably, the data will turn into a hot debate about what the data means for the future. It’s no accident that we would use a Greek myth to refer to the inordinate “uncertainties” that have been unleashed by the June 23rd decision for the U.K. to exit the European Union. While most of us know the basic concepts of “Pandora’s Box” some may have forgotten the important details. “Brexit” may seem like a small, or remote threat to the U.S. housing and real estate market, it does have very far-reaching consequences. For example, in 2015, the U.K. was the largest single source of foreign direct investment in the U.S., accounting for $483 billion, or 16%, of all foreign investments last year. In addition, U.K. foreign investment supports nearly one million jobs across the U.S., with almost one in four of those in the manufacturing sector. Even more important, Britain is the primary channel through which the U.S. exerts its economic and political agenda in Europe, including trade, global tax reform, financial regulation, diplomacy, and other crucial issues. And we haven’t even begun to describe the impact on Europe and the world economy in this description. If you think that it does not impact the U.S. housing market, you won’t want to miss this session. Regarding the important detail of Pandora’s Box, once she closed the Box she did leave “Hope” inside. Gary left his co-CEO role at Starwood Waypoint Residential Trust (ticker: SWAY) in April of 2015 to co-found ROOFSTOCK (formerly DwellConnect), a technology-enabled Internet marketplace designed to dramatically improve transactional liquidity in the SFR sector. In 2009 he joined the board of single-family rental (SFR) pioneer Waypoint Homes and began investing in SFR, eventually joining full-time in 2011 to help raise the first significant institutional capital into the sector. In the fall of 2013 Gary helped orchestrate Waypoint’s merger with Starwood Capital Group, forming SWAY and taking the company public on the NYSE in early 2014. Gary has spent the majority of his career in operationally-intensive and technology-driven companies with a significant real estate component to their businesses. Prior to joining Waypoint, Gary served as CEO of boutique hotel company Joie de Vivre Hospitality and award-winning solar technology start-up Greenvolts. Between 2001 and 2007 Gary was an operating executive with ZipRealty, where as its CFO he led the innovative Internet-based residential brokerage through its successful IPO before eventually being named its President. Gary also spent six years with KSL Resorts where he was instrumental in acquiring and integrating over $800 MM of resort properties. Earlier in his career, Gary worked for leading real estate industry firms LaSalle Partners (now Jones Lang LaSalle) and Security Capital Group. Gary earned a BA in Economics from Northwestern University and an MBA from Stanford Graduate School of Business. Teresa Bryce Bazemore is President of Radian Guaranty Inc., Radian Group Inc.’s principal mortgage insurance subsidiary. As President, Ms. Bazemore is responsible for all domestic and international mortgage insurance business operations. Prior to her appointment as President, Ms. Bazemore was the Executive Vice President, General Counsel, Chief Risk Officer and Secretary for Radian Group, a global credit risk management company. She has previously served in senior mortgage roles at Bank of America and PNC Bank. Ms. Bazemore is on the Board of the US Mortgage Insurers. She serves on the Mortgage Bankers Board of Directors and on the Mortgage Bankers Residential Board of Governors. Ms. Bazemore has also previously served as a member of the Economic Advisory Council for the Federal Reserve Bank of Philadelphia, Consumer Advisory Council of the Federal Reserve, the Fannie Mae National Advisory Council, the Home Builders Institute, the Advisory Committee of the American Association of Residential Mortgage Regulators as well as Board Chair of the Research Institute for Housing America. Ms. Bazemore is a graduate of the University of Virginia and the Columbia University School of Law. Mr. Byce is currently the Senior Vice President of Investments for Investability. Prior to joining in November 2015, Mr. Byce served as SVP of Investments for American Residential Properties (NYSE: ARPI), a publically traded REIT which amassed over 9,000 homes worth over $1.4B. In his role, his responsibilities included management of all acquisitions, dispositions, lending and equity investments for the company. Mr. Byce also founded and managed the Southeastern regional office of Colony Capital, the 4th largest private equity real estate fund in the world. His team handled the acquisition of over 6,000 homes for the company’s single family REIT, Colony American Homes, and managed over $1.5 billion in distressed commercial debt. His career in finance and real estate dates back over 15 years with extensive credit training and construction lending experience including work on management and investigation teams for several FDIC receiverships. Mr. Byce has also owned and operated a financial consulting company, which provided due diligence, M&A and ORE consulting services to community and regional banks. His experience, however, is not limited just to finance. His companies led joint ventures to build residential developments of regional impact in Georgia and he has been an active real estate broker since 2001. Mr. Byce graduated with a B.A. in International Business Finance from the University of Georgia. A specialist in leading strategic initiatives and achieving mission critical priorities, Ms. Charles was the General Deputy Assistant Secretary for the Office of Housing and Deputy Commissioner for the Federal Housing Administration (FHA) at the United States Department of Housing and Urban Development (HUD). In this role she oversaw the operations of the FHA and advised on policy and regulatory development, portfolio management, legislative affairs and communications in the areas of Housing Counseling and Single Family, Multifamily and Healthcare mortgage insurance and finance. Previously, Genger served as a Senior Policy Advisor and the first ever Chief of Staff to the FHA Commissioner. Ms. Charles has led multiple high priority initiatives impacting primary and secondary mortgage markets, FHA insurance funds, and affordable housing, including FHA’s Blueprint for Access, the sale of mortgage notes through the Distressed Asset Stabilization Program (DASP) and the Multifamily Small Buildings Risk Share Initiative. Genger has also served as a key decision maker in the establishment of FHA mortgage insurance premiums, enforcement policies and organizational change management through the Multifamily for Tomorrow Transformation Initiative and institutionalizing the FHA Office of Risk Management. A frequent media contributor, speaker and guest lecturer, Genger earned a Bachelor of Science in Policy Analysis and Management from Cornell University and is a graduate of The George Washington University Law School. During law school she worked as a law clerk for the U.S. Department of Justice Antitrust Division, the Senate Judiciary Committee and at the government affairs and public relations firm Dutko Grayling (formerly Dutko Worldwide). In 2013, Ms. Charles was selected for the inaugural class of the President's Leadership Workshop, a highly selective leadership training course created by President Obama to prepare the next generation of Senior Administration Officials by offering participants an opportunity to refine management, communications and leadership skills. From assisting in the development and implementation of strategy on operational, legislative, legal and regulatory issues, to securing the passage of legislation in multiple sessions of Congress, Ms. Charles has a breadth of experience in multiple facets of the affordable housing and housing finance industries. In addition, Mr. D’Vari has served as an adjunct professor at Harvard, Boston University and UCLA School of Engineering. He holds MBA, MS and PhD degrees from UCLA, is a CFA charter-holder and is currently serving as a Fellow for the Tufts University Sovereign Wealth Fund Initiative. Sarah Edelman is the Director of Housing Policy at American Progress. Her work focuses on foreclosure prevention, single-family rental, and promoting access to affordable housing. Edelman’s publications have been cited by The Financial Times, MSNBC, and Bloomberg, among others, and have been used as a resource by numerous advocacy and community groups across the country. Prior to American Progress, Edelman worked in the areas of community development, community organizing, and consumer protection at Public Citizen, Community Legal Services, the office of Sen. Sherrod Brown (D-OH), and the Federal Deposit Insurance Corporation, or FDIC, Division of Consumer Protection. Early in her career, Edelman served as a Peace Corps volunteer in El Salvador and an AmeriCorps VISTA volunteer in Philadelphia. Edelman holds a master’s degree from the University of Maryland School of Public Policy and a bachelor’s degree from The George Washington University. Mr. Flahive joined Amherst Holdings as President of Single Family Equity in May of 2015. Prior to Amherst, Drew worked at Goldman Sachs & Co. At Goldman Sachs Drew most recently served as a managing director and head of the Real Estate Equity Capital Markets group. He joined Goldman Sachs in 2004 and led more than 150 transactions valued at more than $90 billion, including offerings for real estate investment trusts in the single family rental sector. A recovering investment banker, Rich deserves the Single-Family Rental Lifetime Achievement Award... for being one of the first to embrace the Single-Family Rental sector as an institutional asset class during his time at Jefferies. Having previously spent time at Lehman and Bank of America, Rich is embracing startup life and only wonders why he waited this long to dive in! Being Canadian, of course Rich put himself through college rappelling out of helicopters to fight forest fires. Don’t they all? Laurie Hawkes is the former co-founder of American Residential Properties, which is one of the top-five fastest-growing companies in the housing industry. In the past year, she has taken ARPI public as a REIT, and overseen its first rental-backed securitization, backed by 2,876 single-family homes in the company’s portfolio. Ms. Hawkes co-founded the Phoenix Fund and ARM in early 2010, as well as ARP LLC in October 2008. From 1995 to 2007 Ms. Hawkes worked at U.S. Realty Advisors, a $3 billion real estate private equity firm, becoming a Partner in 1997 and serving as President of the firm from 2003 to 2007. In the seventeen years prior to joining U.S. Realty Advisors, Ms. Hawkes was a Wall Street investment banker specializing in real estate and mortgage finance. From 1993 to 1995, Ms. Hawkes was a Managing Director in the Real Estate Investment Banking Division at CS First Boston Corp., and from 1979 to 1993 was a Director in the Real Estate Investment and Mortgage Banking Departments at Salomon Brothers Inc. During her investment banking career, she structured and negotiated more than $16 billion in real estate acquisitions and securitized mortgage debt transactions for all property types utilizing many types of financing, including private equity, capital markets financial institutions and institutional investors. She holds a BA Degree from Bowdoin College and an MBA from Cornell University. Andrew Jakabovics is vice president, policy development at Enterprise Community Partners, a national nonprofit organization that creates opportunity for low- and moderate-income people through fit, affordable housing in diverse, thriving communities. Andrew oversees the Policy Development & Research team, researching issues related to affordable housing, housing and community development, housing finance, foreclosures and neighborhood stabilization, and broader housing supply and demand concerns. Recent publications include "Staying in Place to Get Ahead: Creating Renter Stability through Master Leases with Built-in Savings Accounts", "Projecting Trends in Severely Cost-Burdened Renters: 2015-2025," "Bending the Cost Curve: Solutions to Expand the Supply of Affordable Rentals", and white papers on housing finance reform and mortgage settlements. He has also been analyzing small multifamily properties, neighborhood change, and the demographics and socioeconomics of renter households in the United States. Prior to joining Enterprise, he served as senior policy advisor to the assistant secretary for policy development and research at the U.S. Department of Housing and Urban Development. His primary focus was on housing finance reform, with a particular eye toward issues of access and affordability. In addition, he devoted attention to foreclosure prevention through improving opportunities for modifications and to mitigating foreclosure impacts on neighborhoods and communities. Prior to joining HUD, Andrew served as associate director for Housing and Economics at the Center for American Progress, where he authored some of the earliest policy responses to the foreclosure crisis, including proposals for mortgage restructuring, foreclosure mediation and REO rental. Andrew has testified before Congress and appears frequently in the media. He currently serves on the Board of Managers of the National Community Stabilization Trust. Andrew holds degrees from Columbia University and the Massachusetts Institute of Technology. Adam Krahn is Vice President, Mortgage Policy and Counterparty Relations at Quicken Loans where he provides policy expertise on a wide range of issues from housing legislation, regulatory changes, and the broader policy environment in the origination, servicing and capital markets. Prior to joining Quicken Loans, Adam was involved in a similar role at Wells Fargo as assistant vice president of capital markets. Before working at Wells Fargo, Adam spent two years at the Consumer Financial Protection Bureau assisting in policy development in the mortgage, student loan, auto loan and peer-to-peer loan markets. Adam earned his bachelor’s degree studying Economics and Mandarin Chinese at Harvard University. Eoin Matthews is Point’s co-founder and Chief Business Officer. Point is focused on unlocking $18 trillion in residential real estate equity wealth in the US. An alternative to secured debt, Point's first product lets homeowners sell Point an option to a fraction of their homes. Point is backed by leading VC's including Andreessen Horowitz, Bloomberg Beta and Ribbit Capital. Prior to founding Point, Eoin was on the founding teams of Sendgrid and Metails (acquired by Buy.com). He has held senior leadership roles at Rakuten, Buy.com and VigLink. Eoin holds a B.Eng in Mechanical Engineering from National University of Ireland, Galway. Tony Meola is the Enterprise Shared Services Executive for Bank of America. Formerly U.S. Consumer Operations executive at the Bank, he led holistic operations functions for the Consumer Banking and Legacy Asset Servicing businesses. As U.S. Consumer Operations executive, Tony’s responsibilities included mortgage and specialty servicing operations, loss mitigation and liquidation for default mortgage servicing, collections and recovery, enterprise fraud and claims management, service delivery and enterprise customer complaints. He led the effort in Bank Of America that resulted in the OCC COnsent order being lifted. Tony has 27 years of leadership experience within the banking industry, including his previous position as CEO of Saxon Mortgage, a Morgan Stanley company. In this role, he was responsible for all aspects of Morgan Stanley’s domestic, residential mortgage business strategy and operations. He originally joined Morgan Stanley in June 2007 as chief operating officer of its U.S. Residential Lending Operations. Prior to joining Morgan Stanley Tony has also held senior leadership roles at Washington Mutual, PNC Mortgage and Citigroup Mortgage. Tony earned his B.S. degree in accounting from Rutgers, The State University of New Jersey, in Newark, N.J. He is the executive sponsor of Bank of America’s Southern California Black Professional Group (BPG) chapter and the Women Leaders Network and an avid supporter of the company’s employee networks and Diversity and Inclusion efforts. He is a memeber of the faculty of the joint effort of the Ross Business School at University of Michigan and BAnk of America in operational leaders development. He is also the former chairman of the Lender Leadership League at the Five Star Institute, a former member of the Mortgage Bankers Association’s Residential Board of Governors and the Housing Policy Executive Committee. In addition, he is the author of the book 90 Days to Success as a Manager. In 2013, he was awarded the Five Star Lifetime Achievement Award for his work in the mortgage industry. Kristin Messerli is the Founder and Managing Director of Cultural Outreach Solutions, specializing in helping companies in the mortgage industry better reach and serve multicultural and Millennial homebuyers. Her expertise is in multicultural marketing, Millennial homeownership, and compliance with diversity regulations in the Dodd-Frank. Kristin is a frequent speaker at national conferences in the industry and has written for numerous publications. In addition to her business, she consults with the National Association of Hispanic Real Estate Professionals Consulting Services, and she is the co-author of the MBA’s Section 342 Compliance Essentials Toolkit. Kristin started her career in the mortgage industry and later worked as a social worker both locally and abroad, training providers on culturally competent practice. Prior to starting her own business, she consulted with former McKinsey consultants at the Center for the Creation of Economic Wealth to develop international social enterprises. Kristin is fluent in Spanish and holds her Masters in Public Administration from the University of Oklahoma. Logan Mohtashami is a financial writer and blogger covering the U.S. economy with a specialization in the housing market. His work has been published by Benzinga.com, Business Insider, and in his own highly respected blog, LoganMohtashami- Financial Truth. His blog articles are frequently reposted by economic insiders sites such as David Stockman’s Contra Corner, The Wall Street Examiner, dshort.com, Advisor Perspectives and quoted by HousingWire, BankRate.com, AmericanBanker, Danielle DiMartino Booth and many others. Housing experts such as Professor Amir Sufi, (Booth School of Business), Professor Anthony Sanders (George Mason University) and reporters from CNBC and the Wall Street Journal have quoted Logan. Audio interviews with Logan have been featured on Jason Hartman’s Young Wealth Show, and he is a recurring guest on David Lykken’s Blog Talk Radio and Kathleen Hays Bloomberg Financial where he does the national housing market preview at the start of each year. Logan is a senior loan manager at AMC Lending Group. Tim became CEO of Ten-X (then Auction.com) in June, 2015 after serving as the company’s Chief Financial Officer for just over a year. He oversees all aspects of Ten-X’s efforts to transform the way that real estate is bought and sold. Prior to joining, Morse helped numerous technology companies – from start-ups to industry powerhouses – implement strategies that support sustainable growth, including nearly 3 ½ years at Yahoo! Inc. (NASDAQ: YHOO) where he held the role of chief financial officer and also served as interim chief executive officer. After leaving Yahoo! in the fall of 2012, Tim joined online advertising start-up Adap.tv, where he led IPO efforts to near conclusion. Just before going public, the fast-growing tech company was acquired by AOL, Inc. (NYSE: AOL). For 15 years, Morse also held numerous positions of progressively greater financial leadership at General Electric Company, with experiences in a variety of GE businesses spanning roles across the globe. In July 2005, Morse was named CFO and general manager of business development for GE Plastics. He left GE in 2007 to become CFO for Altera Corporation (NASDAQ: ALTR, recently acquired by Intel), a San Jose-based maker of programmable logic semiconductors. Morse graduated from the Carroll School of Management at Boston College, where he studied Finance and Operations & Strategic Management. American Enterprise Institute (AEI) resident fellow Edward J. Pinto is the codirector of AEI’s International Center on Housing Risk. He is currently researching policy options for rebuilding the US housing finance sector and specializes in the effect of government housing policies on mortgages, foreclosures, and on the availability of affordable housing for working-class families. Along with AEI resident scholar Stephen Oliner, Pinto is the creator and developer of the AEI Pinto-Oliner Mortgage Risk, Mortgage Market, and Collateral Risk Indexes. An executive vice president and chief credit officer for Fannie Mae until the late 1980s, Pinto has over 42 years of experience in housing finance. Pinto has a J.D. from Indiana University Maurer School of Law and a B.A. from the University of Illinois at Urbana-Champaign. Marianne Sullivan was Fannie Mae's Senior Vice President for Single-Family Business Capabilities. Reporting to the head of Single- Family Mortgage Business, Sullivan was responsible for developing Fannie Mae’s Single-Family business capabilities strategy and execution. She led industry-wide innovation initiatives to streamline and automate key mortgage origination processes and tools including developing Collateral Underwriter™ and income and asset verification tools. Previously she has led the loan quality initiative, was the Single-Famly Credit Risk Officer and managed various credit management areas of the company. Sullivan has more than 20 years of experience in mortgage banking and mortgage finance in Fannie Mae’s Finance, Multifamily, Credit, and Single-Family divisions. Prior to joining Fannie Mae in 1992, Sullivan was an Audit Manager at KPMG, with responsibility for supervising client relations and reviewing, researching, and auditing financial information for clients. Sullivan has a bachelor of science in business administration from Georgetown University. Mr. Tennyson is President of Clayton Holdings LLC and is responsible for the overall operating results of the company’s business lines. Mr. Tennyson joined Clayton in February 2015 as Chief Operating Officer. Mr. Tennyson is the former Chief Executive Officer and Chief Operating Officer of B2R Finance, L.P. B2R (a Blackstone Group sponsored company) is a specialty finance start-up company dedicated to providing innovative mortgage financing for owner/operators of single family residential rental properties. Prior to B2R, he was the Chief Executive Officer of Strategic Lending Group and Managing Director of Strategic Growth Bank (“SGB”). Mr. Tennyson was responsible for the leadership and direction of the residential mortgage enterprise at SGB. Prior to joining SGB, Tennyson, was the Chief Executive Officer of Charlotte, NC based EquiFirst Corporation (a Barclays subsidiary) in addition to being a Managing Director of Barclays Capital. EquiFirst was a national non-agency mortgage lender and under Jeff’s leadership, EquiFirst grew from start-up to being a top 15 national lender with over 1,400 employees and originating over $12 billion annually in residential mortgage production. Diane Tomb is Executive Director of the National Rental Home Council (NRHC), a non-partisan organization dedicated to advocating on behalf of the 16 million home single-family rental industry on legislative, regulatory and capital market matters. As the NRHC’s first Executive Director, Diane works to educate the public, the media and policymakers about the economic value of the industry and the benefits of large-scale, well-managed single-family rental housing platforms. Diane is an accomplished executive and entrepreneur who founded DC-based public affairs and business advisory firm Tomb & Associates LLC in 2003. From 2011–2013, she served as President & CEO of the National Association of Women Business Owners (NAWBO), where she represented members on public policy issues before Congress and at the White House. Prior to that, she served as Assistant Secretary of Public Affairs at the Department of Housing and Urban Development and in the White House in both the Reagan and Bush 41 Administrations. She also served as SVP for communications at the Fannie Mae Foundation. She currently serves as a commissioner on the Bipartisan Policy Center’s Commission on Political Reform and is a member of the International Women’s Forum of Washington, DC. Mike Travalini joined SMS Assist in February 2016 to focus on the company’s rapidly growing residential division. He joins SMS Assist from Waypoint Homes, where he served as the Senior Vice President of Operations. Mr. Travalini oversaw the national repairs and maintenance department, which included a nationwide team of technicians responsible for maintaining the company’s portfolio of 17,000 homes and related customer service and technology initiatives. Prior to Waypoint Homes, Mr. Travalini was the director of acquisitions at the Laramar Group, a Chicago-based residential owner and operator with more than 40,000 national apartment units. He began his career as an auditor in the real estate practice group at the Boston office of Ernst & Young LLP. Mr. Travalini, a CPA, earned his MBA from Northwestern University’s Kellogg School of Management with concentrations in Real Estate and Finance. He earned his bachelor’s degree in Accounting from Boston College. He serves on the leadership teams of the Kellogg Real Estate Alumni Club and the Chicago Real Estate Private Equity Group. Tony is responsible for strategic development and leadership of Clayton’s European business. An acknowledged expert in mortgages, risk management and funding solutions, Tony founded and led Home Funding from 2006–2015. During his career, which spans 40 years, he developed Kleinwort Benson’s innovative mortgage originating and securitisation business, Mortgage Funding Corporation PLC, was CFO then CEO of Britannic Money. Chairman of the Intermediary Mortgage Lenders Association (IMLA) and Deputy Chairman of the Council of Mortgage Lenders. Allan Weiss is Founder/CEO of Weiss Residential Research, creator of residential real estate indexes and forecasts. He has been awarded several US patents for related financial products. Mr. Weiss is also co-founder and former CEO of Case Shiller Weiss, producer of the S&P Case Shiller Home Price Indexes and forecasts, which were published regularly in The Wall Street Journal. Mr. Weiss is co-inventor of Macro Securities, recipient of the Time magazine award for one of the best inventions of 2008. He has been interviewed and consulted by national media, including The Wall Street Journal, The New York Times, the Washington Post, and CNBC, as an expert in residential market trends and financial products. He has also co-authored articles in the Journal of Portfolio Management, Journal of Real Estate Finance & Economics and Real Estate Economics, concerning the establishment of liquid markets and hedging solutions. Mark Wolf is the Founder and Chief Executive Officer of AHV Communities. He is responsible for executive oversight, managing new acquisitions, strategic partnerships, investor relations and operations. Since inception, he has overseen the acxaquisition and construction of over 1,500 lots and secured capital commitments of over $300 million. Prior to forming AHV Communities, Mark was a Founding Partner of the multifamily platform at Greenlaw Partners in Newport Beach where he was responsible for the oversight of multifamily investments. In addition, he was the Founder and Managing Principal at Sicuro Realty Partners, a multifaceted advisor capital provider for the multifamily sector. Over the course of his 20 year career, Mark has been directly involved in the acquisition, development, construction financing and lease-up of over 12,000 multifamily units requiring $3 billion in capitalization and an aggregate in excess of $4 billion encompassing all real estate types spanning the United States. Mark attended the University of Arizona and graduated from Florida Atlantic University in Boca Raton, Florida with a B.S. in Finance and International Business. He currently holds his real estate sales license in the State of California. Barton Creek Resort has been the home of the AmeriCatalyst from 2009 through 2013, when the event moved from Europe to North America as EuroCatalyst/ Distressed Servicing 2009. Its seclusion offers delegates the opportunity to develop new and strengthen existing relationships of worth that form the backbone of the AmeriCatalyst Network. Surrounded by gently rolling hills and lush gardens, Omni Barton Creek Resort & Spa welcomes visitors to experience the legendary tradition of Texas-sized hospitality. Every aspect of the Barton Creek resort, located just outside Austin, Texas, embodies the spirit of the Hill Country, from their friendly staff and warm spaces to their gorgeous property filled with sculptured gardens and exciting things to do. Booking: Delegates will receive the link to book a room using the special event pricing for AmeriCatalyst 2016 in the confirmation email after registration is completed for the event. Suites are limited. Inquire about availability by contacting christina.thigpen@americatalyst.com. Event: The dress code for the reception on Sunday evening is casual. For event sessions, the dress code is business casual. Golf: Golfers must dress appropriately while on the golf course and driving range. Fashions designed specifically for golf are acceptable. Slacks, hemmed walking shorts, sleeved shirts with collar, men’s and ladies’ fashion collarless golf shirts and ladies’ sleeveless golf shirts, and soft spike golf shoes are acceptable. No jeans, cargo shorts or cut-off shorts are allowed. Fitness: Appropriate athletic attire and athletic shoes are required on the fitness floor. The 11,000 square-foot fitness center has something to offer everyone — group exercise classes, personal training, free weights, assisted weight machines, TRX Training Center, and outdoor running and stretching areas. This state-of-the-art facility features new Precor Cardio Theater Equipment. It’s hardly commonplace for an event in the housing and mortgage industry to be built upon an academic or intellectual foundation. Then again, this is part and parcel of what differentiates AMERICATALYST (and its predecessors: EUROCATALYST and EUROPESERVICING) from the other events out there. Below, AmeriCatalyst founder and CEO, Toni Moss, explains the intellectual inspirations behind the event, and where some of its unique qualities came from. Along the way, she provides key insights into the historical development of the industry, and details how these insights allowed her to anticipate the market failures responsible for the unprecedented circumstances shaping our present and future. THE REITH LECTURES ON “RUNAWAY WORLD”. In 1999, Professor Anthony Giddens, director of the London School of Economics (and largely considered the world’s most prolific sociologist), presented a stunning series of lectures which rocked the academic world: how a newly defined force called globalization was rapidly reshaping our lives. The five-part presentation series, titled “Runaway World”, was featured in The Reith Lectures on BBC Radio 4. To illustrate the widespread impact of globalization, each of these lectures was delivered from a different city across the globe, including: Globalisation: London, Risk: Hong Kong; Tradition: Delhi; Family: Washington DC, and ended with Democracy: London. These broadcasts were just the beginning of the international conversation on the interconnected forces swiftly transforming our cultural environment. ...and its influence. I got hooked on the phenomenon of globalization after reading Kenichi Ohmae’s book The Borderless World in a political science class during college; since then it has become one of my life pursuits to understand its impact on the housing ecosystem. By 2000, “globalization” was a pervasive “buzzword,” yet no one could fully define what it was. What differentiated Giddens’ approach was the way in which he defined it as a synchronous set of forces (social, cultural, political and economic) as opposed to one dimensional change (economics or internationalization). In his series, Giddens describes how these forces change every aspect of our lives from the micro level (our families, ourselves, our identity) to the macro level (multinational corporations, nation-states, and the economy). In this way, globalization has created a world so complex that it is beyond our control and understanding. Based on my previous career in housing finance and my work in 18 (by that time) European markets, Giddens’ lectures led me to recognize that housing--and the finance of it--has the same ubiquitous micro-to-macro weight on a singular and social level. Notwithstanding the universal need for shelter, for most aspiring homeowners a mortgage is the largest amount of money they will ever borrow, for the longest period of time. Not only is It the axis of their overall financial portfolio, they will spend the majority of their working lives paying it off. At a societal level, mortgages have long been the anchor product for all financial institutions throughout the world. At national economic levels, outstanding mortgage debt typically exceeds at least 60% of the GDP of every Western country in the world. And at the global macroeconomic level, mortgages and real estate were, by 2001, the single largest asset class in global capital markets. But changes were occurring on all these levels far earlier than this time. By the mid-'90s, securitization had become a global (as opposed to purely U.S.) endeavor, and countless financial institutions began commodifying and leveraging their mortgage assets in order to access global capital markets. The more these products were embraced by the global investor community, the more complex and obtuse the issuance structures became. As mortgage-related investments and house prices around the world significantly increased, it appeared to me that mortgage markets were becoming, in essence, the epicenter of the global economic faultline. As the forces of globalization continued to accelerate the linkages between financial institutions, it also magnified the systemic risk of over-leverage in a single asset class which would inevitably rupture. Were that to happen, I believed that it would be a global phenomenon that would profoundly change the world, and that we should get all industry constituents together in one place to take a closer look. Because globalization is ultimately unstoppable, this is why it continues to be the context of of our event and why our program is focused on how its forces are reshaping the housing ecosystem. So, we adapted Giddens’ idea to hold his lectures in different cities, and began a mobile event to address the reshaping at hand. We moved our forums to a different country each year to show how globalization (and the not-so-invisible hand of Wall Street) was driving change in all housing markets around the world. Our initial event, in 2002, was held in Madrid because I believed that Spain would get hit worst were the implosion to occur. EUROCATALYST 2003 was held in Lisbon, as Portugal was the largest issuer of MBS in Europe that year. EUROCATALYST 2004 was held in Berlin to highlight (much to their chagrin) the implosion of German banks that year. We moved EUROCATALYST to Rome in 2005, the year in which Italian issuance and debt reached its highest level. Fearing the worst, that year w e also launched an additional event, EUROPESERVICING, to bring attention to the urgent need to improve the servicing operations of European banks and market players. In 2007, EUROCATALYST was held a final time in Europe, back in Madrid - one month after the liquidity crisis of August 2007 that led to what everyone still calls “the crisis”. The problem with calling it a crisis is that it implies a beginning and an end. There is no “end” to this. It was not “the perfect storm” as most analysts referred to at the time. It was climate change. THE BURNING MAN PROJECT. The Burning Man Project is a highly participatory annual gathering in Nevada’s Black Rock desert which celebrates the creati on of a temporary city in which its members engage in radical self-expression and self reliance. The event is a dynamic and collaborative laboratory that changes every year in its themes, massive temporary installations, and villages. At the end of each event, a massive wooden effigy (“the Man”), along with practically the entire city, is burned to the ground. As I began putting the event together in 2000/2001, the Euro had just been launched as an electronic currency (January 1, 1999) and the Euro banknote was about to be introduced as legal tender (January 1, 2002). The world stood puzzled at what would happen as twelve European states ceded their sovereign destiny to a central bank with no political infrastructure to support it. It struck me as the greatest social experiment in our lifetime, but one whose procedures appeared backwards: were they attempting to build a roof to a house who had no foundation? To me, the lack of calculation showed the extent to which globalization demanded urgent economic integration among smaller countries to compete in a globalized world. Of course, not every experiment works (take, for instance, Brexit), but we’ll never know if we don’t try. ESTHER DYSON. The career and work of the renowned visionary and futurist Esther Dyson had an enormous impact on me. Most influential was her self-styled PC (Platforms for Communication) Forum: held from 1997 to 2006, the event featured the most important individuals and burgeoning ideas in the technology industry. Esther was, in fact, the primary catalyst for bringing Silicon Valley together, and continues to be the primary catalyst for gatherings in whichever sector she directs her interest. As a friend a nd mentor to me, when I could not convince the IMF or World Economic Forum to do this event, Esther urged me to do it myself. She even participated in our first Madrid event in 2002 as our keynote speaker. Today, Esther is a leading angel investor focused on breakthrough efficacy in healthcare, government transparency, digital technology, biotechnology, and commercial space travel. THE LONG NOW FOUNDATION. Established in 1996 by the most influential “digerati” in science, culture, and technology, The Long Now foundation strives to promote long-term thinking in today’s fast accelerating culture. As a counterpoint to what they see as the “pathologically short attention span” of civilization, the Foundation has established a 10,000-year clock as an icon for public discourse. In 2003, they established a series of Seminars with a narrative of long-term perspective, hoping to help make such thinking common and automatic rather than rare and d ifficult. With some of the most fascinating discussions amongst the most brilliant minds in the world, The Long Now Foundation is an extraordinary opportunity for anyone who wishes to participate. Participation is open to anyone who wishes to join, and I highly recommend doing so. ...and its influence. I am very proud to be Member 724 of the Foundation, and was introduced to it by Esther Dyson in 2007. The premise, activities and ideas have been instrumental in changing the way that I view the housing industry and its comprehensive viability and sustainability. For an industry that extends credit thirty years into the future, it is shocking that we possess no long-term planning committees or organizations. For this reason, in 2012, I established the 501c(3) non-profit AmeriCatalyst Idea Lab. While the organization carries many goals, the primary intention of the Idea Lab is to establish a long-term thinking committee focused on the viability, sustainability and balance in the housing ecosystem. JOSEPH STIGLITZ. In his 2001 Nobel prizewinning work on asymmetry of information, economist Joseph Stiglitz (and his colleagues Akerlof and Spence) focused on imperfections of information, and how pervasive imperfections in information can lead to pervasive failures in the market. According to Stiglitz, one cause of these imperfections can be stated very simply but often goes overlooked: different people in a market know different things. In applying this theory to mortgage markets, as early as 2001 it was already clear that the sellers, structurers and arrangers of mortgage-backed securities (and later, CDOs) knew more about the performance and characteristics of their portfolios than the investors who were buying them. The pace of deal flow led most investors to rely exclusively on ratings instead of performing their own due diligence - despite the fact that every single industry-wide MBS conference had sessions with both rating agencies and investors complaining incessantly about the lack of transparency and information in MBS transactions. (This also occurred at EUROCATALYST from 2002 up to 2006, and we have the video footage to prove it). GEORGE SOROS. The concept of “reflexivity” in social science was developed by the philosopher Karl Popper, illustrated in the work of Giddens, and applied to economic theory by George Soros. Reflexivity is a very dense topic, and difficult to summarize in this editorial. Suffice it to say that it is a way of understanding causes and effects in which the relationship between the two does not flow in just one direction; rather, the agents in any event affect each other bi-directionally (both the apparent causes and effects create each other’s existence). That is, perhaps neither what appears to be a cause or what appears to be an effect can really be understood so simply when investigated under the microscope of a critical mind. Let us apply this to the changes we’ve undergone in real estate. In a real estate bubble, the precipitating trend has been cheaper and more available credit. What turns this trend into a bubble is the misperception that the value of the collateral is independent from the value of credit. In fact, they are not independent--their relationship is reflexive. The relationship flows both directions in that the more available the credit, the greater the increase in property transactions and the rise in house prices. The same is true for equity leveraging. Et voila: The bubble driven by cheap housing credit, the over-leverage of homeowners and financial institutions, and the globalization-driven interconnectedness of those financial institutions led to an implosion of the global economy. In the case of mortgage markets, the predominant “efficient market hypothesis”, which states that all relevant and available information is represented in market prices, was not only discredited, but disproven. While Soros’ reflexivity theory continues to receive criticism from economic standard-bearers, I would point out that Soros’ theory predicted the “crisis,” and preceded it. On April 30, 2008, my EUROCATALYST business partner (and EUROCATALYST event producer) Shirley Jackson and I had just wrapped up our last European event, EUROPESERVICING 2008, which was held in London. At that time, the unthinkable collapse of housing markets was gaining momentum in the U.S. and its effects were already in full force across Europe. For me, it was time to sell my home in The Netherlands and return to the U.S. after 13 years abroad. Although I had written to both Joseph Stiglitz and George Soros to speak at the EUROCATALYST event each year starting in 2002, Soros graciously sent other speakers from his organization to the event in his stead, but he never spoke himself. As for Stiglitz, my annual (and lengthy) requests went unanswered. I knew from the outset that my efforts could never stop the inevitable; however, I did feel a certain degree of disappointment that EUROCATALYST did not make a dent in stemming the tide. Furthermore, because my ideas and vision--in essence, my body of work--were incorporated into the event each year (rather than in high-profile papers or public editorials), and because our events were not open to media, the only awareness of them was among our alumni. In the continual process of research for each year’s program and reaching out to new speakers who are entirely unfamiliar with me, my own history or this event, they most often assume that I am nothing more than “a conference producer” and know little to nothing about the topics or content. One can only imagine the frustration. In those moments of frustration, I remind myself that this extraordinary occurrence actually happened: When Shirley and I arrived uncharacteristically early at Heathrow Airport for our flight back to Amsterdam, we ran downstairs for coffee at the Starbucks in the Arrivals area. While there, I noticed a chauffeur holding a sign with the name JOSEPH STIGLITZ on it. I went over and asked the chauffeur when “Joe” would be arriving. The chauffeur told me that he was expected soon but didn’t know who he was or what he looked like so I volunteered to find him. I disappeared into the arriving crowd and found an exhausted Stiglitz, fresh off of a flight from South America. I seized the opportunity to introduce myself, and blurted out, “I’m the one who has written to you for six years asking you for help in applying your theory about asymmetries of information to mortgage markets at my conference and you never responded and now look at what has happened! Where were you?” Smooth, wasn’t I? Joe stared at me for a minute, then a glimmer of recognition appeared on his face as he said, “Yes. Toni Moss. EuroCatalyst. You know, you were right! I should have been there.” As he walked off with his chauffeur, I turned to Shirley and asked, “Did you hear that? Tell me you heard it.” She assured me that she did, in fact, hear the whole “episode”. P.S. : Seriously. What are the odds of running into those two in one place within ten minutes of each other? It’s too bad that there were no iPhones in 2008, and all I had was a Blackberry. Otherwise, I would be posting the selfies.